El Paso's Mission Trail - DesertUSA . Unfortunately, in their rush to put El Paso and Juárez behind them, our unwitting travelers miss some of the most historic places in the Southwest. As you will find, El Paso often promotes its “mission trail,” with two Spanish-era missions and a presidio church, as its premier attractions, and while important, El Paso’s focus represents only part of a much broader geographical and temporal passageway, which encompasses both the U. S. and Mexican sides of the Río Grande. The El Paso region, with a natural ford of the Río Grande, a corridor between two mountain ranges, and rich soils along its riverbanks, has long held a magnetic attraction for the human species. Nomadic bands hunted big game in the El Paso region during the Ice Ages. Hunting and gathering bands passed through the region for thousands of years, taking small game and harvesting ripening wild plants. Semi-sedentary bands supplemented hunting and gathering with rudimentary agriculture in the region as early as three or four thousand years ago. Village farmers grew corn, beans and squash along the Rio Grand during the first and early second millennium. Raiding bands plundered prehistoric settlements in the region then took sanctuary in the mountains and desert. Signaling profound change, the Spaniard Núñez Cabeza de Vaca, in his epic overland journey from the Texas Gulf coast to Mexico, apparently passed through the area in 1835. An ill-fated missionary expedition, bent on bringing Catholicism to the Puebloan peoples on the upper Río Grande, traveled through the El Paso and Juárez region in 1881. Don Juan de Oñate led an expedition across the Rio Grande ford at El Paso and Juárez, headed north to found the Southwest’s first European colony, in 1598, more than two decades before the Pilgrims landed at Plymouth Rock. Franciscan Fray García de San Francisco founded the Mission Nuestra Señora de Guadalupe in what is now Juárez in the 1650’s, planting the seed for the first European settlement at the pass almost three quarters of a century before Franciscan friars founded the famous missions of San Antonio. Within the next three decades, the Spanish in the El Paso and Juárez area fought back Indian revolts and plundering and struggled against oppressive poverty. 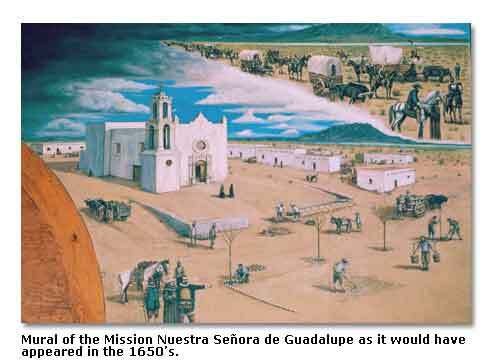 They founded new settlements and missions in the 1680’s to accommodate refugees from a revolt of the Pueblos in the north; the new communities included Ysleta and its Corpus Christi de la Ysleta del Sur mission and Socorro and its Nuestra Señora de la Limpia Concepción de los Piros de Socorro del Sur mission, both now on the U. S. side, downstream from Fray Garcia’s mission. During the 18th century, the Spanish founded a presidio (military post) and church at San Elizario, still farther downstream, to help defend against relentless raiding by the Indians, especially the Mescalero Apaches. 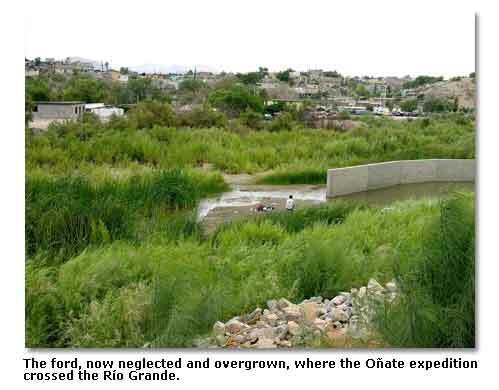 They struggled with the inevitable droughts of a desert land and occasional destructive flooding by the Río Grande. Planting vineyards, grains and fruit in the midst of all the hardships, the Spanish and their Indian converts made the desert valley of the Río Grande bloom. 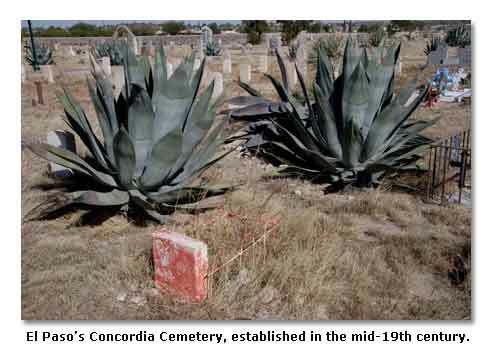 In the early 19th century, Mexico wrested control of the El Paso region and the Southwest from Spain. Yankee merchants opened a profitable trade through the Chihuahuan Desert between Ciudad Chihuahua and Santa Fe, following an ancient trail that passed through El Paso and Juárez. In the middle of the 19th century, the United States wrested control of the El Paso region (north of the Rio Grande) and the Southwest from Mexico. 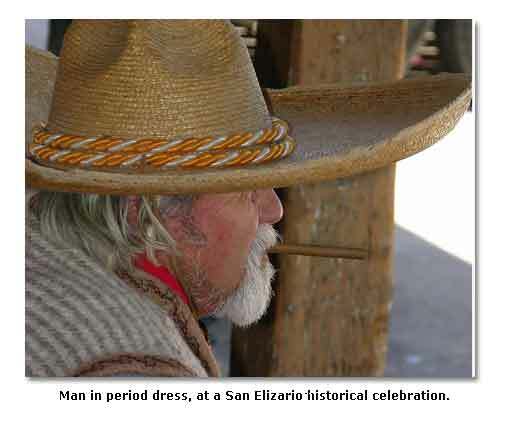 Emigrants, cowboys, gold seekers, adventurers, Butterfield’s stagecoach passengers, and railroad barons pushed through San Elizario, up the river, through Socorro, Ysleta and El Paso, then turned westward, headed for California. In the second half of the 19th century, the U. S. Army founded Fort Bliss to protect the area and travelers from marauding Mescalero and Chiricahua Apaches, Comanches and Kiowas. Enterprising merchants, traders, saloonkeepers, gamblers, gunfighters, maverick politicians and (gasp) painted ladies put their collective stamp on El Paso and Juárez. In the 20th century, Mexico rose up against the dictator Porfirio Díaz Mori, and the legendary revolutionary Pancho Villa led his forces into battle in the streets of Juárez. Fort Bliss laid the foundation for the mechanization of warfare and trained soldiers for the great battles of World Wars I and II. Meanwhile, architectural genius Henry C. Trost designed and built extraordinary buildings and homes throughout the community. El Paso moved to capitalize on its Indian, Spanish, Mexican and Angle heritage. If you choose to explore the rich, multi-cultural heritage of the region, you will be drawn inevitably to both sides of the Río Grande. Marked by no more than a few homely and neglected monuments, the ford where Don Juan de Oñate led his colonists across a Río Grande  the Plymouth Rock of the Southwest  lies just west of downtown El Paso, where the storied river turns from the south to the southeast. Used by generations, the ford  abandoned and overgrown now and in an out-of-the-way location  once gave rise to a humming center of commercial, military and railway operations. It lies near a 1850’s era home (now a restaurant) of Simeon Hart, a wealthy entrepreneur, and officers’ quarters (now dilapidated apartments) of an early location of Fort Bliss. In the heart of El Paso, numerous buildings date from the late 19th and early 20th centuries, and they bear markers that recall famous gunfight locations, saloons and stagecoach stations. Although many of the structures suffer from neglect and no longer serve their original purpose, you can still see the distinctive period architecture in the facades, doorways and windows. 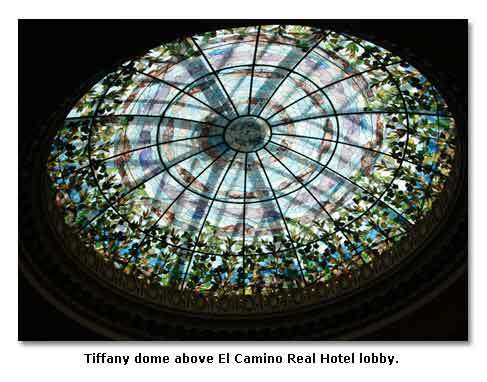 Most importantly, you can stop in the Camino Real Hotel, designed and built by Henry C. Trost in 1812, and you can have a glass of wine in the charming lobby, surrounded by richly burnished wood, marble walls, a glorious Tiffany dome and some arresting art (including, recently, several sketches by Pablo Picasso). Leaving, on the corner of the street along the east side of the hotel, you will see the late 19th century Wells Fargo Building, a two-story Italianate structure with elaborate windows and doorway. A room on the second floor, on the west side of the building, once served as the office of the infamous attorney/gunfighter John Wesley Hardin, who claimed to have shot a man to death because he snored. If you walk across the bridge and over the border at the south end of El Paso Street, you will follow Avenida de Juarez for about six-tenths of a mile to Avenida 16th de Septiembre, passing a bustling procession of stores, vendors, restaurants and bars. Turn right at the intersection, and within a couple of blocks, you will arrive at Plaza de Armas and the mission. “The permanent church, completed on 15 January 1668, was the most beautiful in the entire Custodia of New Mexico, according to an account written by Fray Salvador de Guerra,” said Timmons. “The interior of the temple was decorated with statues, canvases, and landscapes. Under the spacious choir loft was a 15-foot-square baptistry. The sacristy [had] an attached closet holding a handsome chest of drawers where ornaments, chalices, candlesticks, and wine vessels were kept. The convent provided ample quarters for the friars, and an irrigation ditch supplied water for the orchards and vineyards which surrounded the church and convent. Four hundred people attended the dedication ceremony…” Within the church, with its massive adobe walls, you can still see many of the original appointments, and you will find a quietness  a spiritual refuge  from the chaotic streets just outside. As you walk north up Avenida de Juarez, back to the border, take the west side of the street. A few blocks before you reach the bridge, you will find the Kentucky Club Bar, an old tavern where the rich and famous used to hang out. You can get the best margarita in the Southwest at the Kentucky Club Bar, not a bad way to prepare for the usual delay in the crossing back into El Paso. You will come to Ysleta and its mission about 12 miles southeast of El Paso, off Alameda Street. After founding Corpus Christi de la Ysleta del Sur in 1682 to serve Tiwa-speaking Tigua Puebloans who fled southward with the Spanish to escape the violence of revolt, the Franciscans built the first structure for the church in 1692. After rampaging floodwaters destroyed the church in 1742 and its replacement about 1829, the Religious moved to higher ground  the present location  building the current adobe-walled structure in 1851. The Tiguas added a distinctive silver-domed bell tower in 1897. They rebuilt the church yet again after 1907, when a fire destroyed most of the structure. The Tiguas, who achieved official reservation status in 1968, changed the name of their church  the oldest in Texas  to Mission San Antonio de los Tiguas in 1980 in recognition of their patron saint. They have made the mission, with its bultos (religious statues), stained glass windows and an all-saints’ room, the center of their reservation life. While faithful to the church, the Tiguas have held on to their native speech, icons, traditions and heritage. They teach their children the Tiwa language, dance, cooking and pottery making and decoration. They remember their agricultural roots. “Corn was our staple, our motherit sustained us,” tribal council member Javier Loera told the Texas Historical Commission. The Tiguas hold regular ceremonial dance demonstrations in the courtyard before the church. They celebrate the annual Feast of Saint Anthony with a traditional corn dance in the courtyard. “For us, it’s not about having a specific religion, it’s just a belief systemit’s a way of living in unity and harmony with the forces of nature,” Loera told the historical commission. You reach Socorro and its mission about three miles farther southeast, also off Alameda Street. 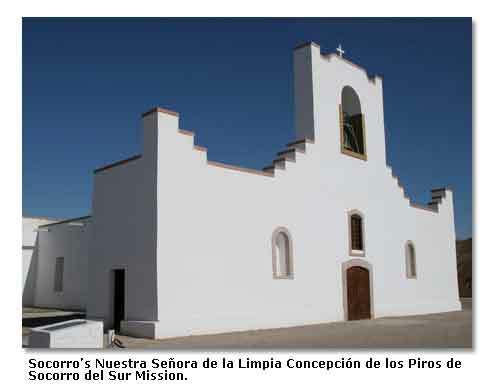 The Franciscans founded the Nuestra Señora de la Limpia Concepción de los Piros de Socorro del Sur Mission on October 13, 1680, to serve Piro Puebloans who fled south to escape the revolt. The friars built the first structure within the next decade. They lost the original church to Río Grande flooding in 1740 and lost its successor to flooding in 1829. They moved to higher ground and built the current adobe-walled building in the early 1840s, with a formal dedication in 1843. Under the guidance of the Religious, the Piros (who spoke a now-extinct Tanoan language dialect) added the front façade, a belfry, a choir loft and transepts during the following decades. On October 19, 1845, they added a treasured statue of the mission’s patron saint, San Miguel, after it had been transported from Mexico to the mission by ox-cart. Socorro very nearly lost its present church around the beginning of the 21st century, when problems with basic architecture and moisture entrapped in the adobe walls threatened the structure with collapse. In a remarkable community enterprise, volunteer organizations, at-risk youth groups, and “Welfare to Work” adult trainees  supported by the Catholic Diocese, universities, schools, endowments, associations, and civic and social organizations  joined in a five-year, 1.5 million dollar restoration project to save the Socorro mission. In the church today, you will find the San Miguel statue, the magnificently restored altar, and the original vigas (roof beams). Behind the church, you will discover the Lourdes Grotto, the work of Father Gerard Decorme, a French priest, in the 1940s. In the Socorro mission complex, you will see a triumph of the human spirit. If you choose to take the walking tour through the San Elizario community, one of the oldest in the nation, you will encounter a smorgasbord of Spanish Colonial, Mexican Period and Territorial history, including not only the chapel but also, for example, markers for the presidio, traces of El Camino Real de Tierra Adentro (Spain’s Royal Road to the Interior), the old cemetery for the community, a way station for John Butterfield’s Overland Mail stagecoach line, the Los Portales Museum, and a number of buildings from the 19th century. 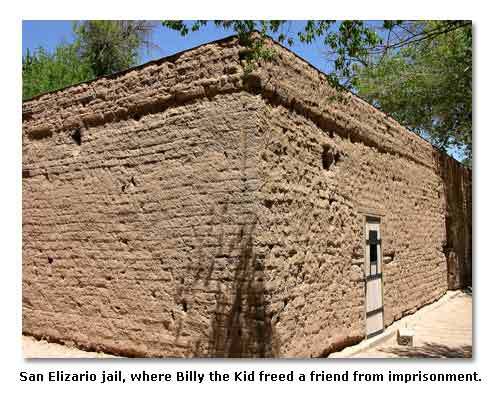 You can even visit an old jail which Billy the Kid broke into to free a good friend, making an escape into Mexico. San Elizario lies near the location where colonizer Don Juan de Oñate struck the Río Grande and, on April 28, 1598, celebrated a Thanksgiving Mass before traveling upstream to the ford. Other than the Camino Real Hotel, downtown El Paso, the missions and the Kentucky Club Bar, our rushed travelers, with no time for persistence, adventure, history or humor, miss a diversity of museums dedicated to art, archaeology, history, Fort Bliss, military aircraft, science, natural history and the Southwest. They miss the charming Magoffin Home, the well-preserved 1875 home of one of the region’s most prominent families, and the Concordia Cemetery, the (often poorly maintained) final resting place of John Wesley Hardin and other famous and infamous figures of the West. I won’t even mention Juárez’ mercados (marketplaces), Plaza Monumental Bull Ring or art and history and anthropology museums or El Paso’s Franklin Mountain State Park (with some fine hikes), Hueco Tanks State Historical Site (a gallery of prehistoric rock art), city zoo, Wyler Aerial Tramway, or Rio Grande valley vineyards. If you are a traveler with time for persistence, adventure, history and humor, you’ll find those places for yourself.